Recently my a good friend of mine received an eviction notice. After having tried for months to gift a piano she had inherited to someone in her community, there was now a heightened sense of urgency. A damage deposit hung in the balance. 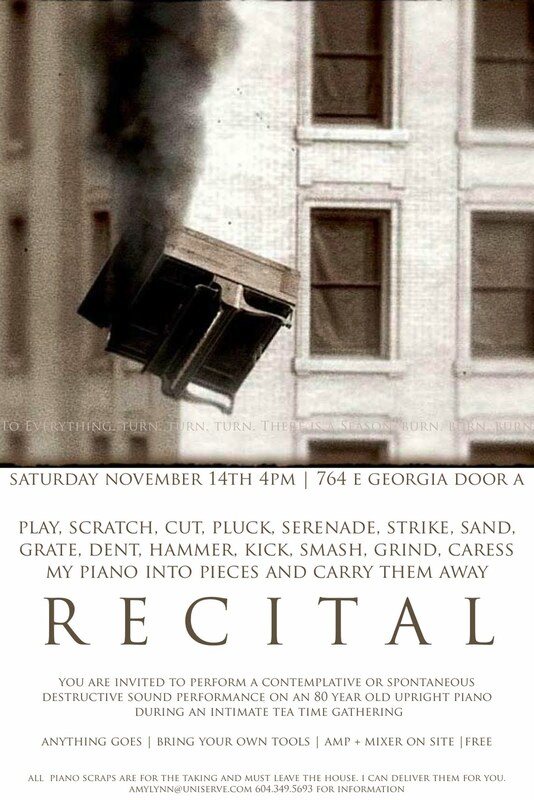 In a demonstration of her remarkable cleverness, and need to avoid hiring piano movers, she decided to not only destroy the piano, but to make it a public performance. An invitation to a "Recital" was sent out to friends and associates offering an opportunity for people to not only witness the destruction of a piano, but to perform a musical or theatrical act themselves. In my next post I'll offer some photos and descriptions of what happened, but first I wanted to offer this as yet another example of a Win-Win Game in the arts, one which implies such amazing metaphorical pictures of the proletariat revolting against modernism, the rejection of specialization, the victory of our animal nature over the forces of civilization, and play in all of its childlike force. Actually the piano as an object to be "deconstructed" is nothing new, even predating 20th Century western classical music's forays into prepared piano, but the piano's greater ubiquity was a result of Fordism, and as such it's destruction as a popular art form is much more modern. Push the piano up to a wall and put the flat side flush against it. Then continue pushing into the wall. Push as hard as you can. If the piano goes through the wall, keep pushing in the same direction regardless of new obstacles and continue to push as hard as you can whether the piano is stopped against an obstacle or moving. The piece is over when you are too exhausted to push any longer. Though it doesn't really call for the destruction of the Piano explicitly, the implication is there in more ways than one. However, many folks have done away with the formalities and just gone at it. Here below are a few videos of pianos (and perhaps western civilization) falling into entropy the fast way.